When you are a non-profit company, you may qualify and receive a grant from Google AdWords. This grant was created to help companies promote their good works and help find volunteers and even donations. If you are lucky enough to receive this grant from Google you probably face the frustrations of the Google Grants optimization dilemma that makes it really hard to max out your full spend. 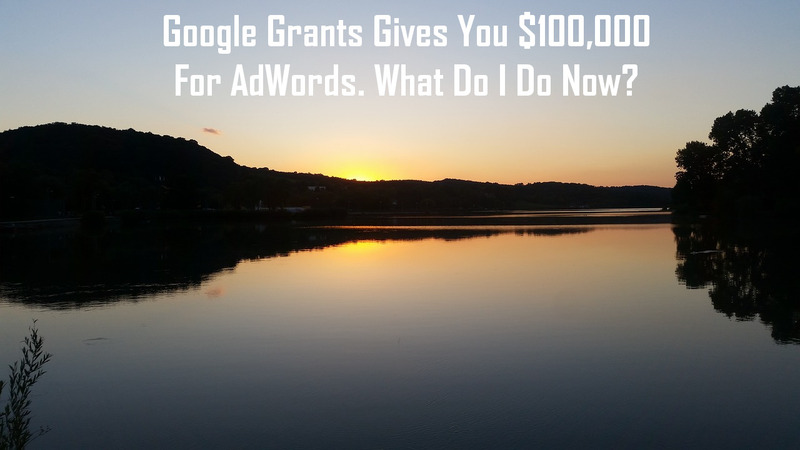 I first came across the Google Grants optimization dilemma with a GrantsPro account with a client. Of course, GrantsPro was the highest Grant available to non-profit organizations back in the day with account holders receiving up to $40,000 a month. If you are familiar with Google Grants you understand that the free Ad spend comes with some constraints on bidding and ad types. Free money is nice, but you have to work really hard to spend it. On normal paid search campaigns, you face the opposite problem of trying to maximize the ROI because it is very easy to spend your full budget. On the other hand, using the entire spend on a low conversion campaign is not your goal either. Though the usual KPI's are still available to measure, the data constraints have changed. In order to optimize, what KPI's are a solid reflection of your PPC management skills? Log into your account and make at least one change every two months. Don't be lazy. You're talking about 30 seconds every two months. I'm sure Google has heard of some thrilling excuses. Google sends out surveys about the program occasionally and you definitely should fill these out. Don't risk Google closing the program down. Do not abuse your ads by sending traffic to a site that isn't the non-profit domain associated with the account. You will lose your Grant. This grant is meant for a specific purpose and this is why there are so many steps to get approved. If you stray from this, you will get punished for it. You need to use the entire budget every month or get really close to maxing out the spend. If you don't, you will lose it. Which means it's time to optimize the campaign to increase spend intelligently. Following the Grant rules is a KPI for your PPC management team to follow because it initializes optimization and retention of the Grant itself. I'm going to make some serious assumptions. If your campaign does not reflect these assumptions, get on it today. Assumption 1: Your Ads Are Relevant and Following Best Practices. You need to have enticing ad copy that is relevant to your keywords, products, services, and brand. Further, your landing page on the ad needs to reflect the ad copy. If you make those changes, it will follow best practices. The reason you simply cannot leave any margin for error on this is because Grant accounts limit your keyword bid max to $2.00 per keyword. Your ads are shown and positioned based on your Ad Rank which measures your ad's relevancy and accuracy. The Ads with higher Ad Rank will have higher authority and give you a better chance of being shown. You cannot expect to outbid competitors with a Grants account. This means you have to do everything possible to outrank your competitors with better ads. Make sure that the landing pages for your ads have some kind of value to them. For example, if the landing page you have has a form, make sure that is set up with a tracked conversion that accurately measures the value of a form fill. Any AdWords KPI metric that involves clicking on the ad is completely useless if the next step in the user interaction is not tracked, measured, and valued. Now, CTR is short for click-through-rate, which measures the percentage of how often your ad is clicked when your ad is shown. The first assumption will maximize how often your ads are shown. The second assumption makes sure you track the percentage of your ad clicks are actually valuable. This gives your ads an estimate of their ROI. Perhaps this is nothing new to you and you already apply this to normal campaigns. After speaking with Google Grant Support specialists, a CTR of 1% is average. A 2% CTR is above average and anything above 3% is considered extremely high performance. Of course, in a normal campaign, these CTR metrics are considered really low so don't use the same benchmarks for different campaign types. Remember though, CTR only tells you the quality and relevancy of your ads from a user perspective. While it tells you how effective your ads are, it doesn't tell you if the ads are working outside of getting clicks. To put this simply, you only reach one level above a television commercial, which provides you with impressions and views at best. T.V. ads would kill to receive CTR data that YouTube can get, but AdWords can do better. Let's start with an example: you run a non-profit that helps underprivileged teens get financially educated. Your website provides information about your non-profit services and societal benefits. Your ads are targeted towards financial educators to volunteer to help teach these kids. The goal is to get them to a landing page that has content discussing how volunteers can help and get users to fill out a form. Your ad was shown 10,000 times but it got clicked only 200 times which means you have a 2% CTR, which is above average on a Google Grant campaign. Now, your ad conversion is the percent of users who clicked your ad, got to your landing page, and then filled out the form. The conversion rate is the number of conversions divided by the total number of people who reached the landing page. So, if 200 people clicked your ad and got to the landing page but only 10 of those users filled out the form, your conversion rate is 10/200 or 5%. You always want to increase your conversion rate. However, if your conversion rate is really high to begin with, it doesn't really give you meaningful data. In our example, 190 users are bouncing or leaving your landing page. It is important to segment your data at this point. A user leaving the landing page but staying on your website is not a bad thing. If a user goes to your website and spends very little time before exiting your entire domain, there is an issue. It means the ad copy did not match the user's expectation once they landed on the site. This user information can either specify your buyer personas further or optimize your ads and campaigns further. Non-profit AdWords grant campaigns will get fewer clicks on average than regular AdWords campaigns, especially in the beginning. You need to make sure you maximize your conversions of the users who make it to your site. By this standard, your conversion rate optimization is the most important KPI. There are other metrics that are important but when it comes to Grant campaigns, emphasizing these KPI's will allow you to get the most out of your campaigns. The spend limitations can definitely leave you confused and frustrated. Though the best practice optimization logic is consistent, you have to adjust to not only keep your spend but get the most out of it. Once you are able to spend the grant correctly, your digital campaigns will improve. If you have further questions or need more assistance please contact us so we can help.